We’re Swift Travel, a family-run business dedicated to limousine and party bus hire in Essex, London and across the South-East. For over 15 years we’ve been providing outstanding luxury travel hire. After all, what’s better than arriving at a party? Arriving at a party in serious style, of course! And we’re on hand to help with that. 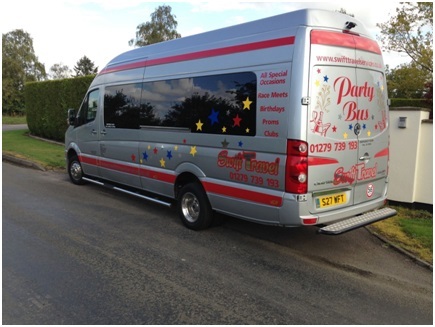 Our vehicles are ideal for birthdays, weddings, corporate events, hen parties, stag do’s and proms. No matter what the special occasion, our experienced chauffeurs are ready to get you there – on time and in style! 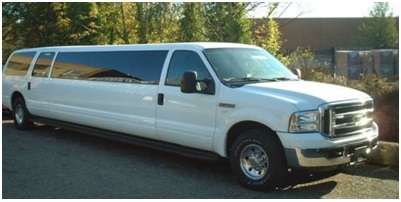 To get the VIP treatment, check out our stretched limousine hire which are perfect for groups of up to 8 or 13 people. Our fleet includes a Ford Excursion limo and our ‘Baby Bentley-style’ Chrysler limo, all complete with leather seating, LED-lit bar areas, mood lighting, passenger-controlled stereo systems and – best of all – complimentary bubbly. Want to get the party started? Then hop inside the party bus. With room for up to 16 people, this is how to get in the mood for any night out. This is the nightclub on wheels, and we’ll decorate it with banners and balloons especially for your special occasion. 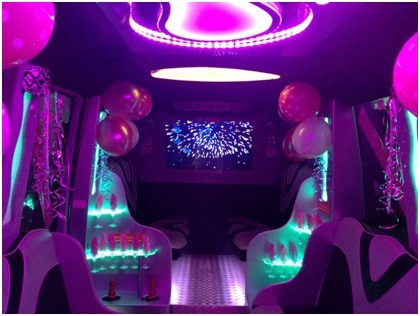 Our party buses comes equipped with disco lighting, karaoke, bar area – with the all-important complimentary bottle of champagne, plasma TVs and even a laser lighting system. Whatever event you’re attending, we can offer a tailor-made package just for you – and we guarantee that our drivers will get you to where you’re going in good time and in good spirits. Ready to celebrate in style? Whether you’re looking to hire a limousine or party bus in Essex, London and the South-East, simply get in contact with us here at Swift Travel on 01279 793193 and let the good times roll!